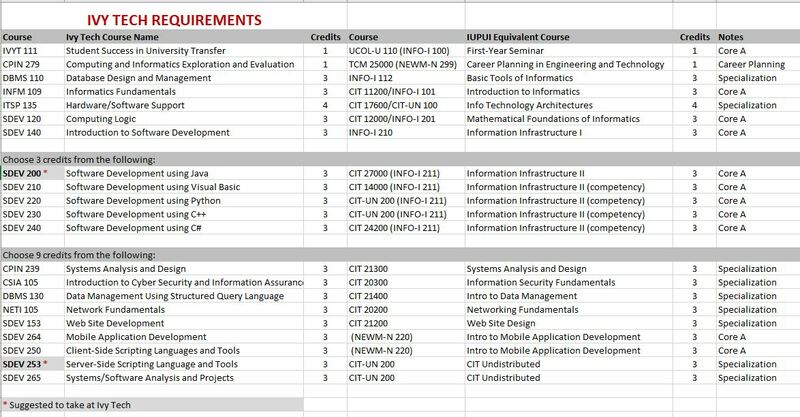 Students who graduate from Ivy Tech with the Associate of Science in Software Development must complete these remaining courses in order to earn the Bachelor of Science in Informatics from IUPUI. By completing you A.S. degree, you will have fulfilled your area of specialization toward your B.S. in Informatics, using software development as your specialization. Electives can be chosen from general unrestricted electives or an area of specialization (minor or certificate) to enhance their degree.